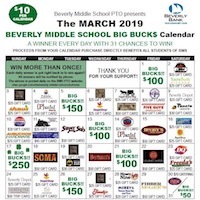 Beverly Middle School Homeward Bound: Big Buck$ - Sell! Sell!! Sell!!! BIG BUCK$ is in FULL EFFECT!!! Who’s in the lead for the Homeroom Bagel World Breakfasts???? Stay tuned…your final day to get your calendar stubs in for this amazing prize is Thursday! Get them to your first period teacher this week so your homeroom can be entered!